Today’s goal was a simple one — determine Sarah Jones’ mother’s surname as a part of my Angley Project. I started with very little information. Sarah was born in October 1899 to James E and Catherine Jones. They lived in Edwardsville, Luzerne County, PA for many years. The first step was to begin searching the 1900 Census. I really like the 1900 Census because it shows the month and year for the individual’s birth as well the number of years of the present marriage. Two important identifying items. Using Ancestry.com, I quickly found the couple in Edwardsville loving on Slocum Street. Not only did the record show daughter Sarah but also three other siblings, James E (who would be proven to be a Junior in the 1910 Census), Annie and Mary. The census showed James & Catherine were born in November 1869 and June 1872 respectively. It also showed they had been married for 10 years. So now, I had their birthdates and Marriage date. Hoping for the easy look, I searched Ancestry.com and didn’t find a record fitting the criteria I had. I then went to Family Search and there they were. James was born on 2 November 1869 and Catherine was born on 22 June 1872. They were married on 21 October 1890[i]. All the pieces fit the and the goal was realized because the marriage record indicated her maiden name was Thomas. As something of a side note, I noticed that the reverend W. D. Thomas married them. I wonder if there is a relationship there. Further research will tell. The ultimate reason for this project is to find a common ancestor between two people’s trees who share a large segment of DNA. The comparison tree doesn’t have a Catherine Thomas in it, so we don’t have a match, yet. That said, the comparison tree does have other Thomas surnames living in Pennsylvania about 100 miles away at the same time. Therefore, the Thomas surname is definitely an area for further research. 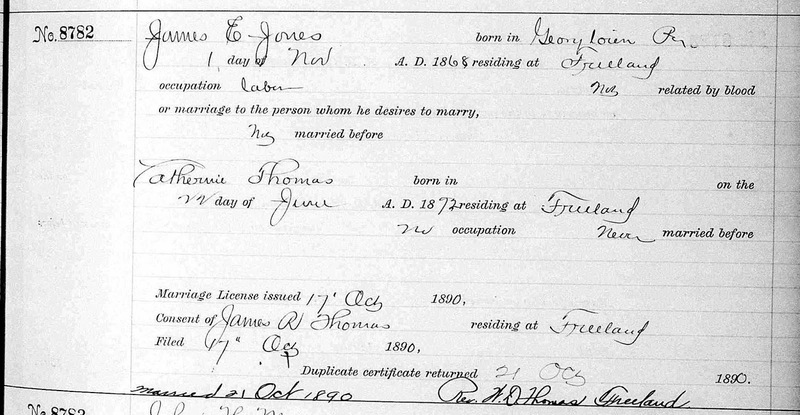 [i] Pennsylvania, County Marriages, 1885-1950, Family Search, James E Jones – Catherine Thomas. https://familysearch.org/ark:/61903/1:1:VF4W-DB7.